I saw this new piece from Vintage Ground today and thought it couldn’t be a more perfect followup to my last post about the energy of objects. This is a GREAT example of a piece of vintage furniture being given a new life… and new energy. If I didn’t know that Brad – the owner – refinishes vintage furniture I would have no idea it wasn’t brand new! I actually have a couple of his pieces myself and the only thing that is keeping me from snagging this beauty is that I literally don’t have the room in my own house (so sad). 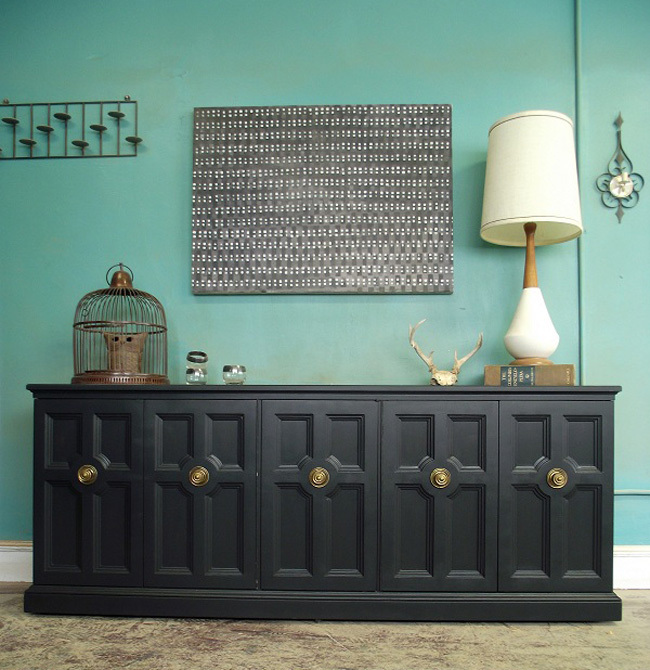 This sideboard is beautiful and is very well designed. It is both classic and modern, I love the panelling on the front and the knob handles that are centered in each door (someday I will have this kind of knob on my front door – LOVE) It has great scale and symmetry and while the original was probably a natural wood finish and today would seem heavy and dated, the simple addition of color transforms this piece into a modern beauty that would look perfect in a lot of different types of space. Definitely take a peek at Brad’s offerings, he’s constantly adding new pieces. The beauty of his work is that everything is one of a kind, so be forewarned they go fast! How did I not know about this guy before?! This is a great find, thanks for sharing, Nancy.